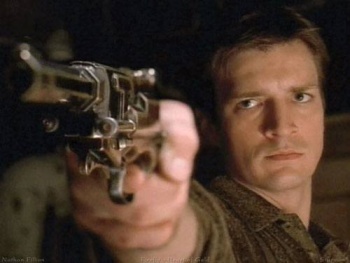 Dedicated Browncoats Want to "Help Nathan Buy Firefly"
In a quip during an interview, Nathan Fillion expressed interest in buying the rights to Friefly and some dedicated fans took that and ran with it all the way to the edge of the 'Verse. The story so far: Back in 2002, there was a little show called Firefly that ran for 12 episodes on the Fox Network. The show was cancelled, but fanatic supporters did everything they could to reverse the decision, including buying an ad in the trade paper Variety to show their support, which many say led to the 2005 film Serenity. 9 years later, the show still has a desperately loyal following and most of the cast and crew, including creator Joss Whedon and star Nathan Fillion, still lament the demise of Firefly. Fillion, who now stars on Castle, joked in an interview last week that Firefly was his dream job and, if he had the means to purchase the rights, he would do so. An enterprising group of Firefly fans, who are collectively known as Browncoats, started an initiative on the website HelpNathanBuyFirefly.com and Facebook to raise awareness and, hopefully, spark a return of the show. The subtitle of the website speaks for itself: "Let's get the Captain his money." Entertainment Weekly asked Fillion about playing Captain Malcolm Reynolds in Firefly because the Science Channel recently announced it was re-airing the episodes. "It was my favorite job ever. What wasn't great about it? I got to wear a low-slung holster. I got to ride horses. I got to have a spaceship. I got to act mean and curmudgeonly," Fillion said. "If I got $300 million from the California Lottery, the first thing I would do is buy the rights to Firefly, make it on my own, and distribute it on the internet," he said when asked if he would join the cast again if given the chance. Other people connected to the show immediately perked up at Fillion's seemingly off-hand remark, lending it more weight. Ex-writer on Firefly Jose Molina said via Twitter, "For what it's worth, I've told [Fillion] I'd drop what I was doing and follow." Another writer, Jane Espenson, who wrote the episode Shindig, replied, "I'm there, if needed." Even Jewel Staite, who played the cute mechanic Kaylee, is on board. "Is the Pope Catholic?" she said when a Twitter follower asked her. Even though the admins fully expect that Fillion was joking, the initiative is picking up steam. The corresponding Facebook page has 71,691 "likes" as of press time and the number continues to grow, with more than a few pledging that they would donate money to the cause. The administrators of HelpNathanBuyFirefly.com are staying anonymous for now, and no way to actually donate money has been set up. The first phase of the plan was to generate momentum, which it seems has been successful, but the second phase is the crucial one: Getting Fillion or creator Joss Whedon to support the cause. Without their blessing, the plan kind of falls apart. So far, Nathan Fillion himself has yet to officially comment on the movement, although he has "liked" the Facebook page. Come on then, Browncoats assemble, hit the signals with news of the cause and make Fillion (not to mention us nerds) the happiest guy in the 'Verse.